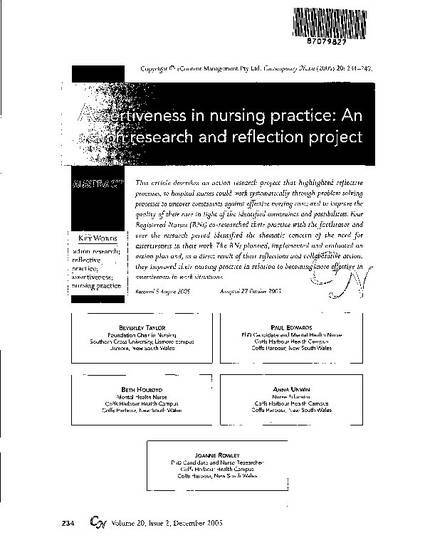 This article describes an action research project that highlighted reflective processes, so hospital nurses could work systematically through problem solving processes to uncover constraints against effective nursing care; and to improve the quality of care in light of the identified constraints and possibilities. Four Registered Nurses (RNs) co-researched their practice with the facilitator and over the research period identified the thematic concern of the need for assertiveness in their work. The RNs planned, implemented and evaluated an action plan and, as a direct result of their reflections and collaborative action they improved their nursing practice in relation to becoming more effective in assertiveness in work situations.